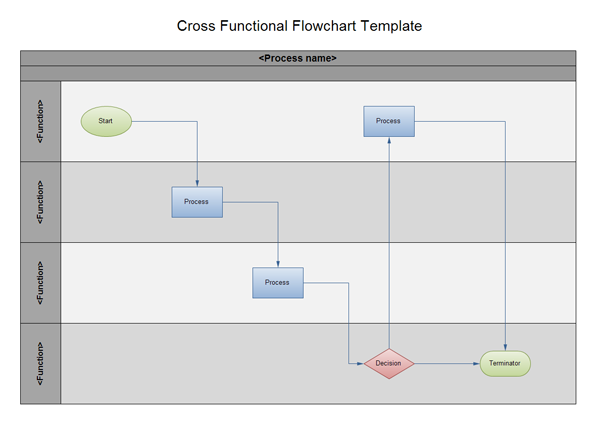 Cross-Functional Flowchart - The easiest way to draw cross functional process maps is by starting with a crolss-function flowchart templates and samples. When a flowchart describes a process in which a number of different people, departments, or functional areas are involved, it is sometimes difficult to keep track of who is responsible for each step. A useful additional technique for tracking this, and for analyzing the number of times a process is 'handed over' to different people, is to divide the flowchart into columns. Head up each column with the name of the person or function involved in the process. And each time they carry out an action, show it in their column. This is illustrated in the flowchart below which covers a simple purchasing process. It shows how the control of the process passes from the person initiating the purchase to the Purchasing Dept, and then to the Supplier. Bands represent the functional units. Shapes representing steps in the process are placed in bands that correspond to the functional units responsible for those steps. 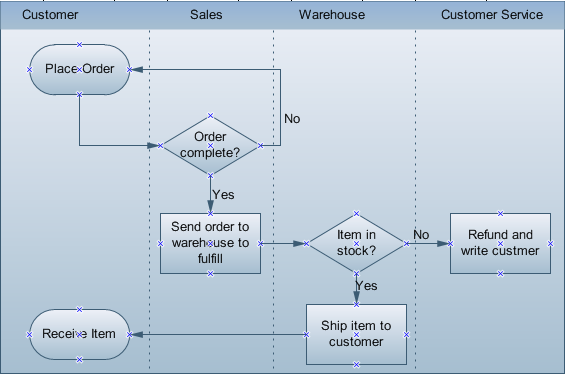 The Cross-Functional Flowchart template is available in two locations. On the File menu, point to New, point to Business Process or Flowchart, and then click Cross-Functional Flowchart. The essential purpose of this template is to help you diagram the relationship between a business process and the responsible party. Edraw supports both horizontal and vertical cross-functional flowcharts. Click here to free download Cross Functional Flowchart Software. Then you can use the built-in templates to create and present your swimlane flowcharts in minutes. You can present any cross-functional process either vertically or horizontally. A vertical layout places slightly more emphasis on the functional units while a horizontal layout emphasizes the process. The orientation option you choose often depends on personal taste, rather than a strict requirement or guideline. You can also choose the number of bands that appears in the diagram when you create it. The best practice is to create enough bands to hold each step of the process you want to document. In a horizontal layout, bands representing functional units run horizontally across the drawing page, highlighting the process. In a vertical layout, bands representing the functional units run vertically from the top to the bottom of the page, highlighting the functional units. What is the difference between Deployment flowcharts & cross-functional flowcharts ? As far as I have seen, there is no significant difference between both. Actually, deployment flowcharts and cross-functional flow-charts seem to be two synonyms for the same concept, otherwise referenced in one paper as a "Process Map". Diagrammatically, Deployment charts seem to me more like UML Activity diagrams with Swim lanes (if you're familiar with UML you'll immediately understand what I mean). In other words, deployment diagrams are flowcharts that focus on showing "who does which activity". I've came across a definition that says "A Deployment Flowchart shows the actual process flow and identifies the people or groups involved at each step. This type of chart shows where the people or groups fit into the process sequence, and how they relate to one another throughout the process." I also came across a paper that identifies both as being the same: "The process map-otherwise known as a cross-functional flowchart or deployment chart-is an excellent tool for clearly displaying process flows across organizational boundaries and identifying delays, repetitive steps, excessive control points, specialized tasks, and potential points of process failure." So, I believe it is plausible to assert that cross-functional charts and deployment charts both refer to the same concept. Cross functional: display the workflow and the functional positions which are involved with each step in the workflow. Each has its own strength and weakness. 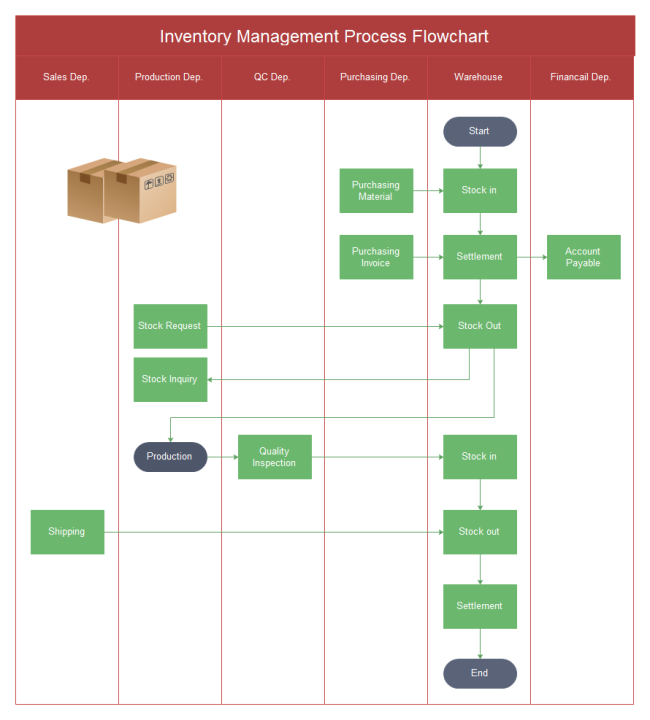 The flow process chart, for example, helps you identify waste and capture processing time but does not clearly display cross-functional activities. For brevity's sake, we will focus on the process map. 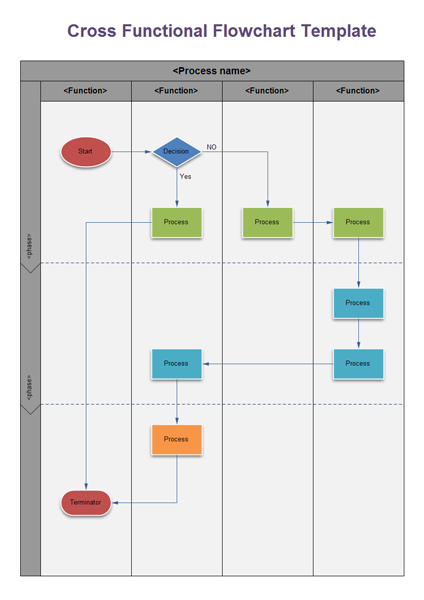 The process map - otherwise known as a cross-functional flowchart or deployment chart - is an excellent tool for clearly displaying process flows across organizational boundaries and identifying delays, repetitive steps, excessive control points, specialized tasks, and potential points of process failure. Building a process map is easy but the results may appear complex if many steps and players are involved. Begin by listing all process players (people or departments) down the left side of a sheet of paper. Separate each player with a horizontal line. Use a double line if the player is from outside of your organization. The bottom access is time, moving left to right. Write the first process step next to the name of the player who performs that task. If you'd like, you may draw a box around this description. Move from left to right as time elapses. Write and box the second process step on the appropriate row. Connect the two steps with a line. Continue to the right documenting each activity on the appropriate row. Any concurrent activities should be aligned vertically. When you are done, the "as is" process will be clearly documented. It can then be analyzed and improved. A process can be an enlightening yet shocking experience. Processes typically evolve over time as people and business conditions change. The result is unneeded layers of complexity and inspection. Your first reaction may be, "Is that really what we do?" Your second reaction will be to fix the process. Here's a list of what you should look for: Non-value added steps. Challenge each process step. Ask yourself, "What value does this activity add? Does our customer care?" Combine, simplify or eliminate activities that do not contribute value. Excessive control points. Inspections and supervisor approvals do not always add value. They evolve primarily due to a lack of confidence in the process. Eliminate control steps that are not critical for quality outcomes. Excessive handoffs. Every time process activities move from one player to the next, there is potential for delay or miscommunication. Try to organize work so that each player becomes more of a generalist and less of a specialist. This will reduce the complexity of multiple handoffs. Task specialization. Assembly line processing is giving way to cellular models for organizing work groups or teams, both on the plant floor and administrative offices. Information flows faster, with less distortion, improving both the quality and speed of work. Consolidate tasks where possible. To create a cross-functional flowchart, the easiest way is using Edraw pre-made cross-functional flowchart symbols. Below are brief guidlines. 1. On the File menu, point to New, then to Template Gallery - Flowchart, and then click Cross-functional Flowchart. 2. In the Cross-functional Flowchart dialog box, choose the basic options you want to start with, and then click OK. Note: After you click OK, you can add or delete bands but you can't change the orientation, add bands with another orientation, or add a title bar. 3. Double-click <Process Name> and then type a name for the process the flowchart represents. 4. Click a band label and then type a name for the function the band represents. Repeat for each band. Tip To zoom out from the flowchart, choose a smaller magnification from the Zoom list on the Standard toolbar. 5. Click the Basic Flowchart Shapes stencil's title bar to display its shapes. Drag the Process or Decision shape from the stencil to the appropriate band(s) to represent the first step in the process. 6. Click the connector tool on the Standard toolbar. Leaving the first shape selected, drag a second shape onto the bands. The shapes connect automatically. Repeat to continue adding process steps, decisions, or data. 7. When you're finished adding shapes, click the pointer tool on the Standard toolbar, and then save the flowchart. Tip: If you don't like the way a connector bends, click the connector. Pause the pointer over one of the green midpoints until the pointer becomes a two-headed arrow. Click and drag until the connector bends the way you want. You can revise your cross-functional flowchart as necessary by adding or deleting bands, shapes, separators, and other features. You can also add process shapes from other types of flowcharts, such as Audit and Workflow diagrams. To locate the shapes, on the Flowchart gallery, point to Flowchart, and then click the library you want to open. Below is a sample cross-functional flowchart showing document management process. To find more examples, click cross-functional flowchart example gallery.